Rod Rosenstein, the US deputy attorney general, is set for crunch talks with Donald Trump on Thursday, amid doubts over his future in the job. 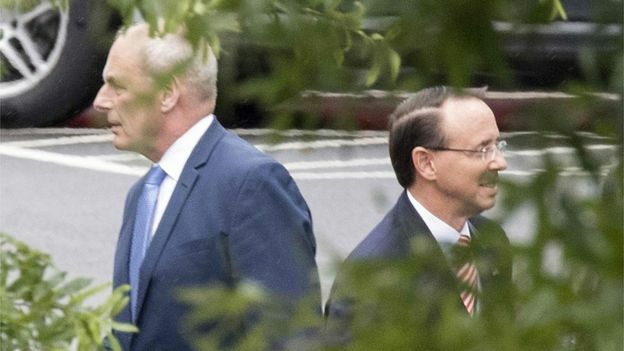 The two already spoke on Monday to discuss reports that Mr Rosenstein had talked last year about ousting the president and secretly taping him. Mr Rosenstein oversees the inquiry into alleged collusion by the Trump team with Russia during the 2016 election. The president said Thursday’s meeting would be “determining what’s going on”. “We want to have transparency, we want to have openness and I look forward to meeting with Rod at that time,” he added, speaking in New York where he is attending the annual UN General Assembly. America’s second most senior law official was summoned to the White House on Monday amid a report that he had verbally resigned to the president’s chief of staff in the expectation that he was going to be fired. But White House press secretary Sarah Sanders said afterwards: “At the request of the Deputy Attorney General Rod Rosenstein, he and President Trump had an extended conversation to discuss the recent news stories. Monday’s meeting between Chief of Staff John Kelly and Mr Rosenstein had been previously scheduled, US media later reported. What happens if Rosenstein leaves? If Mr Rosenstein did lose his job, another Department of Justice official, the solicitor general, would be in line to take over supervision of the Russia investigation. 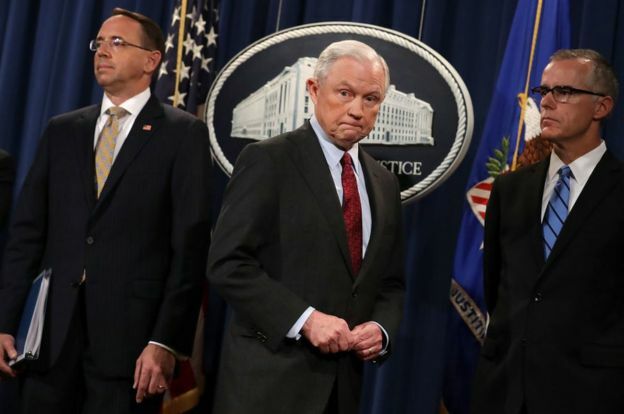 Mr Rosenstein assumed oversight of the inquiry after his boss, Attorney General Jeff Sessions, recused himself when it emerged he had been in contact with Russia’s ambassador to Washington while serving as a Trump campaign adviser. The furore around Mr Rosenstein’s position comes as mid-term elections are looming on 6 November, when the president’s party will try to keep control of the US Congress. Media captionThe 25th Amendment: Could it be used to unseat Trump? What did the report on Rosenstein say? 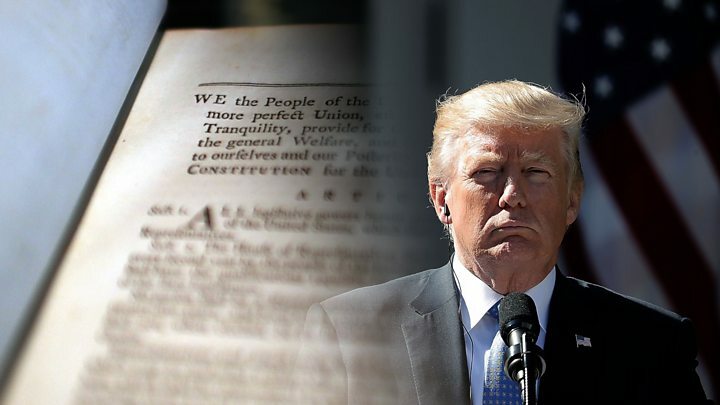 Mr Rosenstein and Mr Trump are believed to have discussed Friday’s report in the New York Times that the deputy attorney general had discussed recruiting cabinet members to invoke a US constitutional clause that provides for the removal of a president if deemed unfit for office. According to the newspaper, Mr Rosenstein had also suggested surreptitiously recording the president in order to expose the chaos in the White House. He denied the claims, and a Department of Justice spokesperson told the BBC the secret recording remark was just a joke. The deputy attorney general was said to have made the comments after Mr Trump fired FBI Director James Comey in May 2017. If Rod Rosenstein goes, by resignation or firing, the future of Robert Mueller’s special counsel investigation would be very much in doubt. Mr Rosenstein is the reason there is a special counsel investigation, and he has given Mr Mueller a wide mandate to pursue that inquiry wherever it may lead. It has resulted, for instance, in the successful prosecution of former Trump campaign chair Paul Manafort and a plea deal from Donald Trump’s personal lawyer Michael Cohen – both for activities tangential to the Russia probe. A different person in charge might have nipped those moves in the bud. Whoever took over if Mr Rosenstein departed – at the moment, Solicitor General Noel Francisco – could decide to curtail the scope of the investigation or push for a speedy resolution. At the very least, Mr Francisco would assume the oversight duties knowing full well the president is watching very closely and has no hesitation going on the attack – even against members of his own administration – if he feels in any way slighted or wronged. As Mr Rosenstein will surely attest, it is an unenviable position. Mr Trump said over the weekend he had not made up his mind whether to fire the deputy attorney general in the wake of the New York Times report. “We will make a determination,” the Republican president told Fox News in the radio interview, which aired on Monday. “It’s certainly a very sad story. Sean Hannity, a Fox News host and friend of Mr Trump, has urged him to not fire Mr Rosenstein, warning he would fall into a trap laid by his political enemies. Mr Trump has repeatedly referred to the special counsel’s Russia investigation as a political witch hunt. Andrew McCabe, the former acting director of the FBI who was fired by Mr Trump in March, said on Monday that he was “deeply concerned” about rumours of Mr Rosenstein’s departure as it would put the Russia investigation “at risk”.